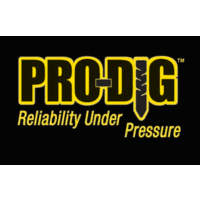 PRO-DIG is an established manufacturer of high quality drilling and piling equipment. Our range of products includes Hydraulic Anchor Drive heads, Foundation Tooling, Excavator Drilling and Piling Masts, Custom Excavator and Skidsteer attachments, Custom Tooling and Torque measurement equipment. PRO-Dig manufactures its broad range of products in state of the art facilities located in Elwood, KS, USA and Cambridge, England. PRO-DIG utilizes the latest manufacturing technologies and techniques including CNC machine centers, Plasma Profiling, CNC Gear Shaping, and fabrication of all metals. All manufacturing operations are carried out within our quality controlled facilities, ensuring you the customer of the high quality products you have come to expect from PRO-DIG year after year. PRO-DIG not only offers world class innovative products, We Stand behind them with industry leading customer and after sales service. We have grown our business considerably with a core principle of always putting the customers’ needs and wants first. We strive not only to satisfy our customers but to delight them with consistent first class service.